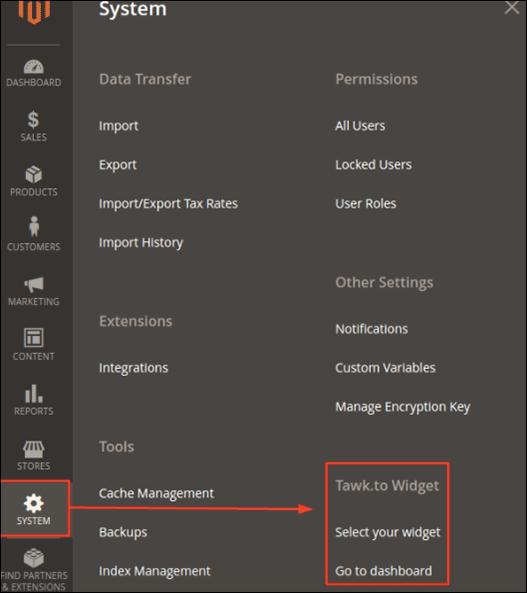 In the next section you will learn how to use the newly installed tawk.to Magento 2 extension. – Select your widget > link a widget to your store views. – Go to dashboard > edit your widgets / monitor your visitors. Login to your tawk.to account here and all available Widgets will be shown in the next view. If you don’t have an account yet click on the link below the login form and create one. Once you are logged in, you can select which store view you wish to link a widget to. Then select a site from your tawk.to dashboard settings and then a widget. Now, save. Now go to your front store and see the widget (here in the bottom right corner). 1. In the Magento Admin, go to Content > Blocks. 2. Click Add New Block and insert a Block Title, Identifier. Select a Store View and be sure the Block is enabled. 3. Click show the editor if it is not already shown and click the HTML icon. 4. Copy the widget code from the tawk.to dashboard into the opened field. 5. Click Update and then Save Block. 6. Once the Block is ready, you have to link a new Widget to it. Go to Content > Widgets. 7. Click Add Widget and select CMS Static Block as Type. 8. Click Continue, set a Title and assign to a Store View. 9. In Layout Updates, select CMS Footer Links as Container and on which pages you want it to be present. 10. Click Widget Options, then select the previous Block you have created. Save, refresh the caches and you are done! You can get the widget code in the tawk.to dashboard.